Spring/Summer collections have never overly excited me, I'm much more interested in Autumn/Winter, couture and menswear collections. It's really rare that I'm wowed by any designers SS collections at fashion weeks, even those that I love the most. There's just something that doesn't do it for me. Pastels, florals and lace just don't float my boat and obviously as cliche as it sounds S/S is full of it. There are a couple of names that always produce a collection for spring/summer that even I love, for example Alexander Wang's SS15 [here] collection at NYFW astounded me. There's no doubt in my mind that the Burberry Prorsum on Monday at LFW will make me go weak at the knees and usually Topshop Unique produce a collection that I can't help but fall in love with. However this year, Topshop have failed to wow me producing an 'alright' collection. There didn't seem to be a specific theme within the collection; beginning with a sportswear vibe that instantly had me hooked that they came back to later, it then moved onto pieces that I can only describe as the "Hampton's summertime look", then the collection finished with some really 'wow' gowns. It just seemed as if there were a lot of ideas mashed together. Cara of course opened and closed the collection, her walk was insane. I don't ever really pay that much attention to the model [as harsh as it sounds, but my attention is on the clothes] but she looked absolutely gorgeous and her walk was so fierce and full of confidence. 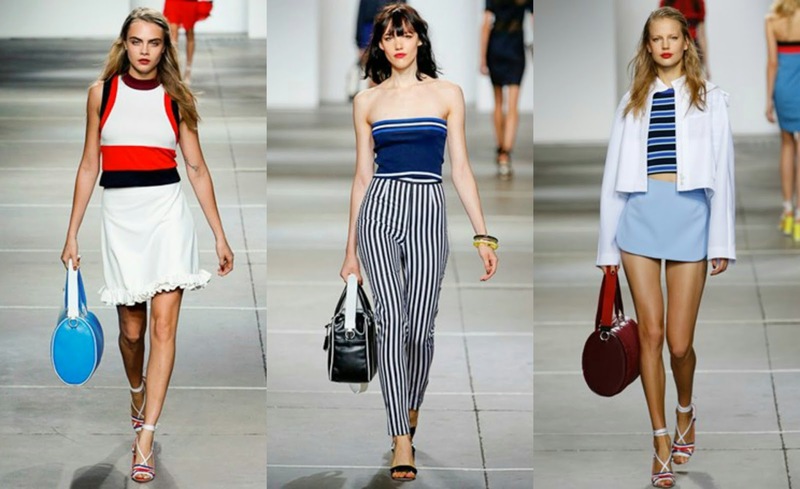 There were elements within these looks I loved, the duffle bags, the sportswear vibe and the emphasis on the waist [extremely familiar, Alexander Wang anyone?]. It might just be me, but I can imagine the likes of Blair Wardolf [Gossip Girl] wandering around the Hamptons in all three of these looks. Shoes; block heels, with strappy details...nothing new. Quite classic looks, clean fresh colours - but a little too safe for a brand such as Topshop that often represents the edginess of British street style. Out of the entire collection, I loved these two looks. A little bit edgier, a mixture of sportswear and streetstyle, something cooler and more reminiscent of the effortlessly cool style us Brits have. I really liked the contrast of the bomber-esc jacket mixed with the sheer pleated skirt, a girly look with a guy twist. Then the second look [again, something we've definitely all seen before but still cool] a little bit of sheer detail and a generally shapeless t-shirt style dress. I kind of felt as if these particular pieces didn't really fit in, but they were still beautiful. SS15 in Topshop is clearly going to be all about lace and detailing, lots of sequins and flowing skirts, these dresses just scream "PROM" or "fairy" as I first thought. I loved how complex and intricate each of these dresses are, definitely more the standard I expected from Topshop Unique. I thought they hung beautifully. Overall, the Topshop Unique show didn't show much originality or ironically, anything unique. In my opinion the AW14 collection earlier on this year was incredible and maybe through my eyes it was just too hard an act to follow. There were some cool pieces within the collection but I expected a lot better and some real 'wow factors'. Topshop is a brand that really sets a presidency for the incredible style that's evident in the UK and I felt that this collection wasn't reflective of that.